We’re bringing the Midas touch to confectionery shelves this August, with the return of our Unwrap Gold on pack promotion on our range of bestselling singles. In 2012, Unwrap Gold gave consumers the chance to win tickets to the London 2012 Olympic Games and became one of our most successful promotions. This year, eight lucky consumers will win an iconic Cadbury chocolate bar sculpted out of 18ct gold. The replicas, which will be presented at an exclusive Cadbury event, are valued at up to £22,000, and winners will benefit from a consultation with a specialist gold adviser on how to invest their windful. For those who don’t get their hands on one of the gold bars, there are plenty more chances to win, with every eighth bar containing a winning code for prizes including cinema tickets and Cadbury chocolate. Click here for more information. Cadbury Twirl, Cadbury Double Decker, Cadbury Dairy Milk single, Cadbury Crunchie, Cadbury Wispa and Cadbury Boost. The new Unwrap Gold promotional bars will feature eye-catching packaging for impactful shelf stand-out and disruptive point of sale. Unwrap Gold has a simple instant win mechanic, coupled with highly desirable prizes, and will be supported by marketing investment, including TV, outdoor, PR, experiential, in-store and digital activity, making it a hugely engaging campaign for your customers. A Cadbury promotion of this scale can act as a signpost to the category. It can create shopper excitement, generating all-important impulse purchases – and, crucially, help drive a sales uplift for your outlet. Drum roll please, for the launch of the new Cadbury Crispello countline to AFH operators. Cadbury Crispello is three delicious crispy wafer shells, filled with a creamy centre and covered in a smooth layer of Cadbury milk chocolate. This new individually-portioned countline allows consumers to enjoy one Crispello piece at a time, or save the rest for later using the innovative resealable packaging. Why should you stock this in store? Since its launch to retailers last year, Cadbury Crispello has proved to boost sales for on-the-go occasions, bringing 190,000 shoppers1 to the chocolate singles category within its first 12 weeks and already worth almost £3 million2. The brand is also being supported by a huge £7 million marketing investment in the first half of 2013, including TV, outdoor, digital and in-store sampling, to get shoppers even more excited about the brand. Cadbury Crispello countline is available in depots now! Designed specifically for away from home operators, this unit displays the biscuit products that meet the needs of your customers throughout the day. I’m excited to tell you about our versatile new biscuits display unit. Designed specifically for away from home operators, this unit displays the biscuit products that meet the needs of your customers throughout the day. Belvita Breakfast, the UK’s number one breakfast biscuit1, is specially designed for an on-the-go breakfast2 – while Oreo, the number one biscuit in the world3, is a tasty treat in the afternoon, the most important time of day for consuming snacks out of home4. Our modular unit is small enough to fit on your counter and allows you to swap between two, threeand four tiers according to your own individual needs. 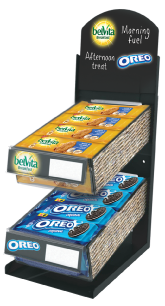 It is able to hold 12 packs per tier of either Belvita Breakfast Milk and Cereal (four pack), Belvita Breakfast Yogurt Crunch (two pack) or Oreo (six or two pack). The new modular unit is available now. To order, phone 0845 603 8314 and quote Delicious Display.